Identifying the over 40 types of oak trees that grow native to North America requires a knowledge of the features that separate oaks from other kinds of trees. Knowing that the oak species exhibit distinct differences among themselves is important to the process. 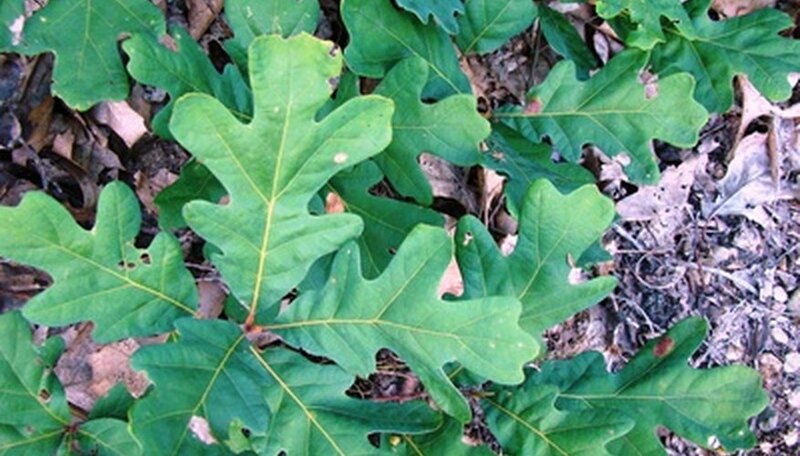 The oaks fall into two groups, with a number of characteristics distinguishing red oaks from white oaks. Look for the presence of hard-shelled acorns on or about a tree. This is the easiest way to tell if a tree is an oak, allowing you to focus on identifying the specific species. 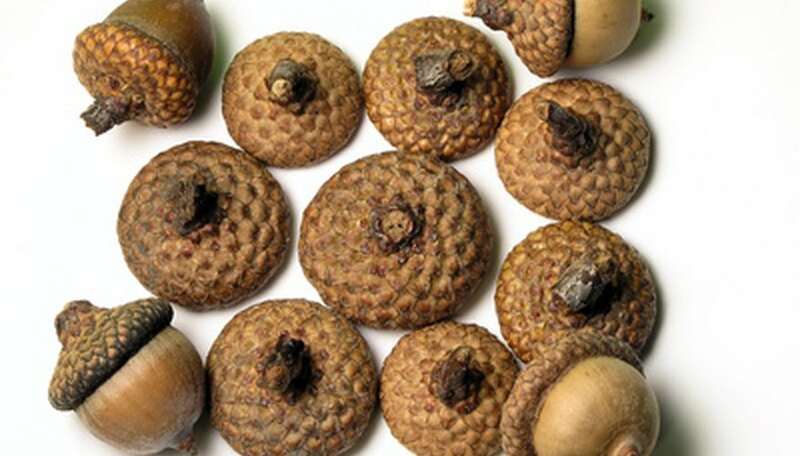 Acorns are oblong or rounded nuts that have a cap on them, with the cap attaching to the branches of the tree. The presence of these saucer or cup-like caps beneath a tree in great numbers is also an indicator that the specimen is most likely an oak. Examine the leaves of the oak tree, remembering that oaks have different shapes to their leaves. The leaves of the red oaks usually but not always have pointy lobes with bristly tips. Lobes are the various sections of the leaf, with these sections separated by the spaces botanists refer to as sinuses. The leaves of the white oaks have lobes on their leaves, in most instances, with a rounded appearance, lacking any bristles on the ends. Check for leaves of the oak species that do not fit either of the descriptions of the red oaks nor the white oaks. These include the chestnut oak leaves with their oblong foliage that possess obvious teeth along the edges. The live oaks usually have leathery oval-shaped leaves. Willow oak leaves are narrow, with a strong resemblance to those of the trees from which it gets its name. Count the individual lobes on the oak leaves to help you recognize the specific species of oak. Some can have as few as three, such as southern red oak, while others may have as many as 11, like the leaves belonging to a Gambel oak tree. With many types of oaks, the number of lobes the leaves have can vary--even on the same tree. Study other features of the oak tree, including the tree’s size, its bark and its location. Some oaks average about 50 feet in height, like the post oak, while others are able to exceed 100 feet on occasion, like a willow oak. The barks of the red oaks species are normally colored black, gray or a brown-black mix. White oak bark is lighter, usually a shade of gray. An oak such as a California white oak grows only in certain parts of the West Coast, while a Chapman oak has a small distribution through Georgia, Florida and Alabama. Inspect the acorns you find on or under an oak, studying closely the size, shape of the cap and the insides of the acorn’s shell. Measure the length of acorns and look at how much of the acorn the cap covers. Look for unusual aspects of the cap, such as frills. Study the inner shell of the acorn. The inner part of the shell on red oaks is either silky or woolly in appearance and texture, while the insides of the white oak shell are smooth.